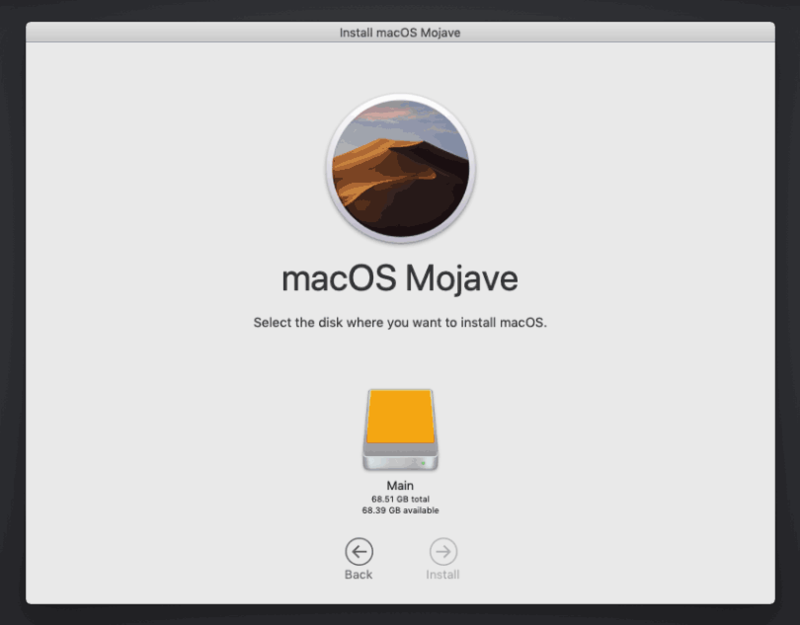 This tutorial for installing macOS Mojave has been adapted for Proxmox 5.4 from Kholia’s GitHub project for installing into vanilla KVM. There is more documentation there which will help out with enabling extra features and diagnosing problems! I’ll assume you already have Proxmox 5.4 installed. 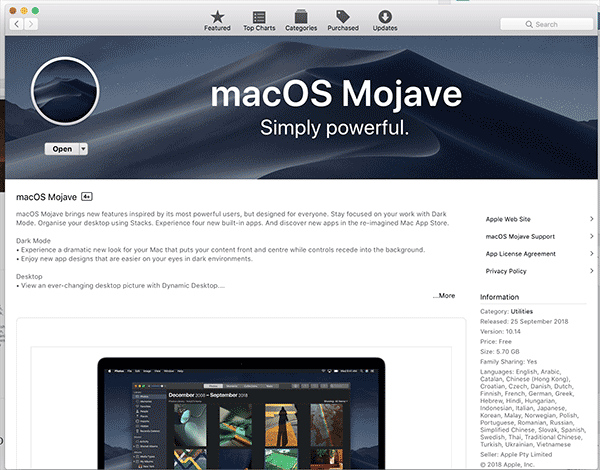 You also need a real Mac available in order to download Mojave from the App Store and build the installation ISO. Your Proxmox host computer’s CPU must support SSE 4.2, so for Intel your CPU must be at least as new as Nehalem, which was the first CPU generation to bear the “Core” i5/i7 branding. Older CPUs will cause the finder to repeatedly crash after installation completes (with an Illegal Instruction exception in the graphics code). Apparently modern AMD CPUs also support SSE 4.2 and can be used with this guide without any modification (maybe Bulldozer and certainly Ryzen), but I haven’t tested this myself. Now run this script in order to create Mojave.iso from the installer. The ISO should get saved to your desktop. Upload the ISO to your Proxmox server’s ISO store (typically /var/lib/vz/template/iso). Note: Apparently if the Mac you’re using for the download is already running Mojave, this won’t let you download the installer properly. There is some advice and workarounds in this Reddit thread. 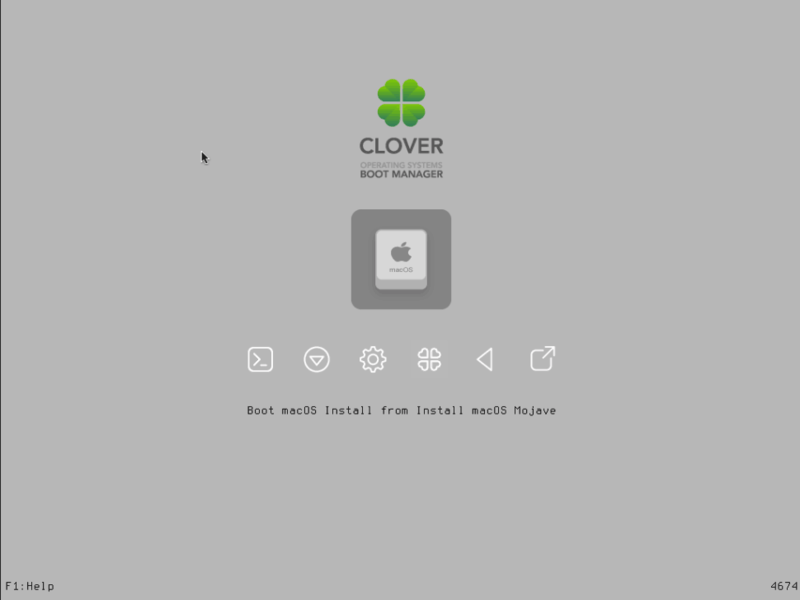 We’ll be using Clover as a bootloader for Mojave. Every Mac uses the same OSK, so don’t be surprised if it doesn’t look like a random string! Set the number of cores for the VM, I chose 4 (note that some core counts seem to be troublesome, try 4 first). Set the CPU to Penryn. I chose a fixed memory of 8192MB. Disable ballooning because there is no balloon driver available for macOS. In the Options page for the VM, ensure that “use tablet for pointer” is set to “Yes”. 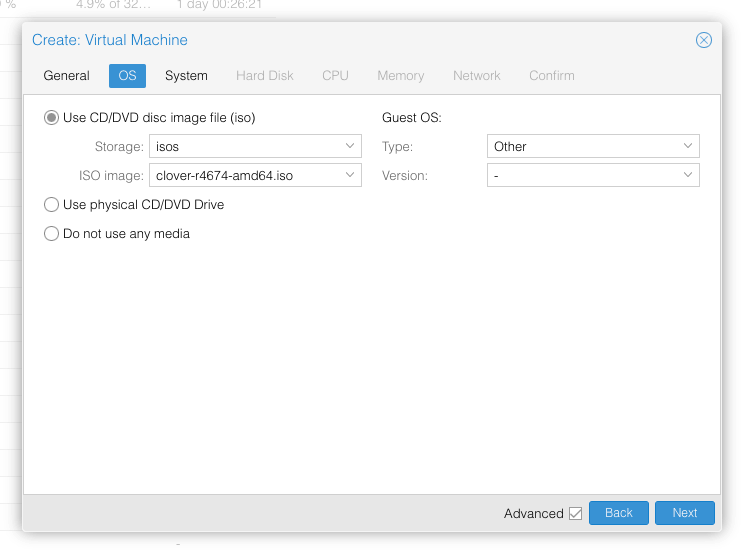 In the Hardware page for the VM, add a second DVD drive at IDE0, set it to use your Mojave.iso. We’re telling macOS that the CPU is Penryn (it doesn’t seem to like booting otherwise), but we’re enabling all the new CPU features found in Nehalem which macOS will require, plus some optional features found in later generations (AVX/AES). Find the line that defines the Clover ISO (ide2), and remove the “,media=cdrom” part from it. Add “,cache=unsafe” in its place. We’ve added this to the config file instead of to the VM’s args directly. If we were to add it to the VM’s args, then when Proxmox constructs its call to KVM to launch the VM, the device definition would appear before the pve-q35.cfg file is included, which defines the USB busses. However, the device definition must appear after the definition of the USB bus that it refers to. Note that this file is whitespace-sensitive, make sure you don’t add any blank lines that have extraneous spaces on them. 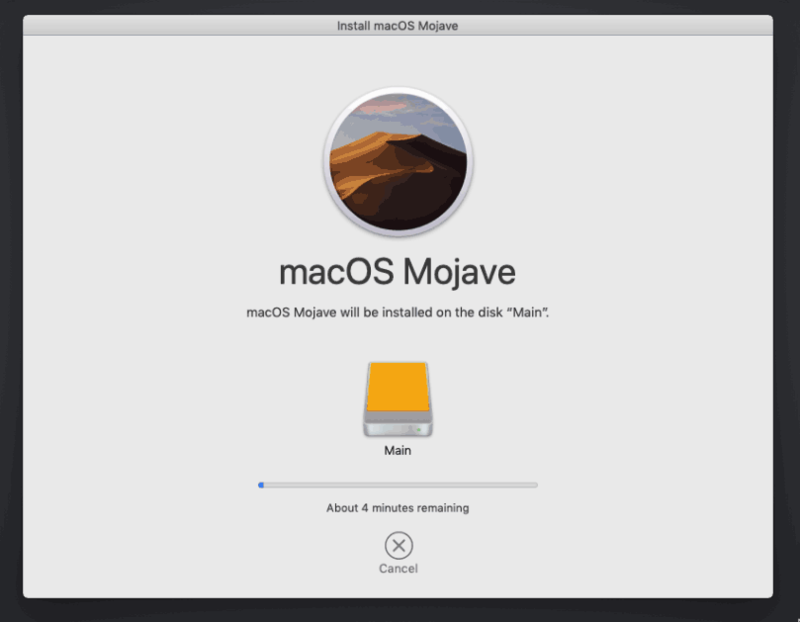 You must now install a patched version of Proxmox’s OVMF library in order to be able to boot Mojave. Go to the Console tab, quickly hit Escape or F2 at the Proxmox logo to enter the OVMF configuration. If your keyboard doesn’t work, leave the Console tab, stop the VM, start the VM, then re-enter the console tab. If pressing escape still doesn’t enter the menu, make sure you are using “machine: q35” in your VM config. 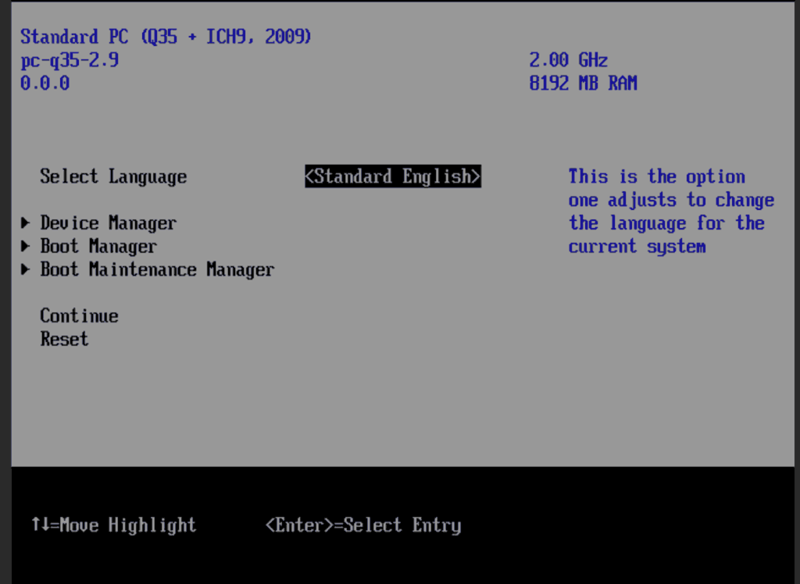 In a small range of Proxmox versions you may need to temporarily remove the USB keyboard config from pve-q35.cfg (sometime in the Proxmox 5.3 era), since the UEFI menu only seems to support the PS/2 keyboard in those versions. Follow the steps above to set the screen resolution to 1024×768 and “reset” to apply the new settings (not “continue”). This step is required to avoid scrambled graphics on boot and a hang (Clover resolution must match OVMF resolution). Note that in future you may find that when initially started, your VM doesn’t properly apply the the 1024×768 screen resolution until you hit “Restart Computer” in Clover when the Clover menu appears (or “Reset” on the VM). You’ll notice this happening when the “Proxmox” logo fills a large area of the screen on boot due to the low resolution. It should now boot into Clover. 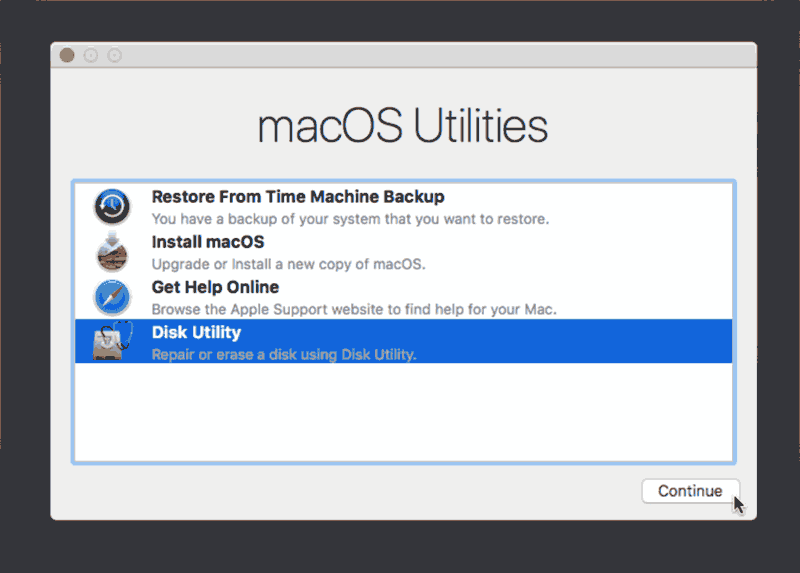 Press enter to boot the “Boot macOS Install from Install macOS Mojave” entry and the installer should appear. Choose your language. Now we’re ready to begin installation! 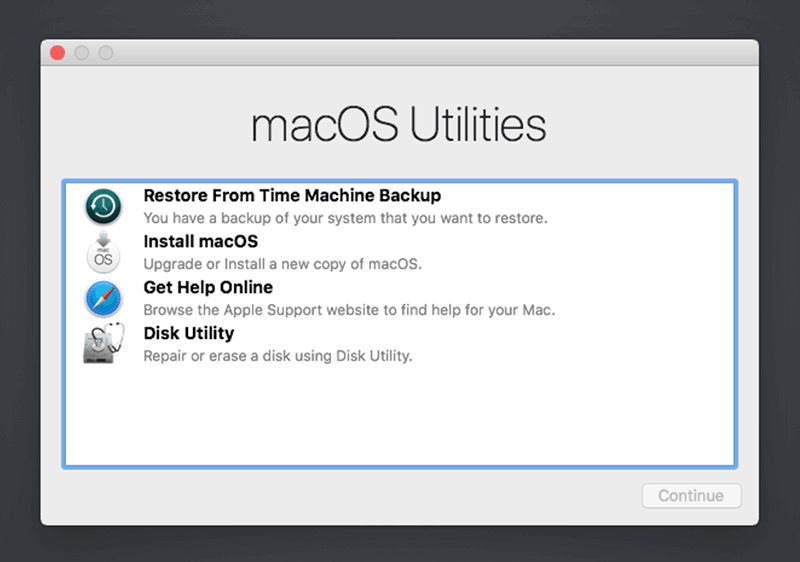 After the first stage of installation, the VM should reboot itself and automatically continue installation by booting from the hard drive, then reboot itself a second time and automatically boot from “filevault prebooter”. We’re currently booting using Clover from the attached CD image. Let’s install that to the hard drive instead. Pop open Terminal and run “diskutil list” to see what drives we have available. Use “sudo dd if=<source> of=<dest>” to copy the “EFI” partition from the Clover CD and overwrite the EFI partition on the hard disk. 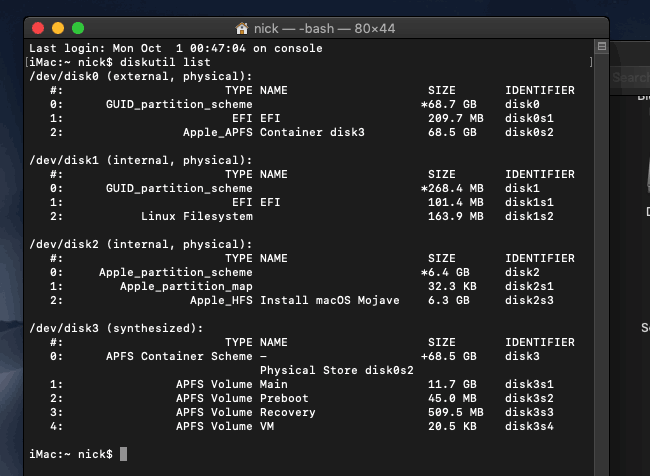 The Clover CD is the small disk with the “linux filesystem” on it, and the main hard disk is the one with the large Apple_APFS “Container” partition on it. In my case these EFI partitions ended up being called disk1s1 and disk0s1 respectively, so I ran “sudo dd if=/dev/disk1s1 of=/dev/disk0s1” (N.B. if you get these names wrong, you will erase the wrong disk and you’ll have to start the installation over again!). Now shut down the VM, and remove both the Clover and the Mojave CDROM drives from the Hardware tab. On the Options tab, edit the boot order to place SATA0 as the first disk. Boot up. 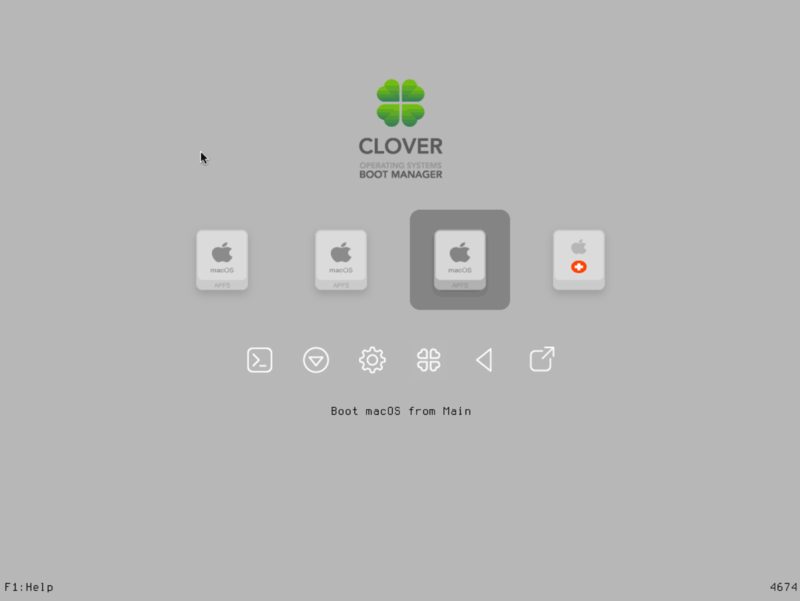 If everything went well, you should see the Clover boot menu, and you can select “Boot macOS from Main” to boot Mojave. On a regular Hackintosh this is typically a sign that the boot drive can’t be read, but that situation is difficult to encounter with this VM setup. Nevertheless, I receive a “prohibited” sign during boot in perhaps 1 out of 20 system boots at random (maybe a timing bug?) If this happens, just hit “reset” for the VM to retry (no need to stop and start). If you get it persistently, something is going wrong with the boot. You can boot macOS in “verbose” mode by hitting space on the macOS option in Clover and ticking the verbose option. This’ll give you a log during booting that can narrow down when the problem occurs. Since I want to use this as my primary computer, I want to use a USB keyboard and mouse plugged directly into Proxmox, rather than sending my input through the web VNC console. You can also pass through USB devices by passing through an entire USB controller using Proxmox’s PCIe passthrough feature. thank you very much, installation runs smooth. Have you tried GPU passthrough? I’ve heard that the Nvidia drivers don’t offer acceleration yet (even after hacking them to force installation on the unsupported OS). I think we’ll have to wait for some time after the retail release before we get those. I have an AMD card I could try, I’ll report back with details. At the end of the guide and in some comments, you talk about to use this VM to make it your primary computer. So on Firefox and Atom I have some strange graphics behavior (you too ?) did you find anything to improve the performances of the VM ? I have no GPU passthrough (no GPU card on the host). Without a passthrough GPU you’ll have no graphics acceleration, which as far as I know dooms you to slow glitchy graphics. Ok i see, you said “I have an AMD card I could try, I’ll report back with details.” can you tell us about that ? Yep I’m now running Mojave with an R9 280x, however it has visual glitches and kills the host the second time the VM is booted. I’ve had the same problems with this card in previous macOS versions. I believe there are much better supported cards available now. I was able to use GPU passthrough – but I haven’t found a solution to the frequently crashing finder – maybe I run proxmox on a Westmere CPU? Run cat /proc/cpuinfo | grep "model name" on Proxmox and let me know what CPU you have. Although being root I get a “-bash: /proc/cpuinfo: Permission denied”?? That’s bizarre, I’ve never seen an error like that while trying to access cpuinfo. Are you missing the “cat” on the start of that command? Your CPU *should* be supported, because it’s a die-shrink of Nehalem and I’d expect it to have the same features. You might have to cat /proc/cpuinfo | grep flags and check if it lists ssse3 (note, three ‘s’s), sse4_2 and popcnt (the new features that Nehalem introduced over Penryn). Shame on me: to dumb for copy/paste! Please ignore my stupid response. I’ve followed all steps above but for some bizarre reasons can’t get Clover to recognize the Mojave iso mounted on IDE0. I’m on the latest version of Proxmox (5.2-5) with all updates applied. Has anything changed recently that could cause this issue? And of course, right after I posted this comment, I found the solution. I mistakenly changed “media=cdrom” to “cache=unsafe” for BOTH ide0 and ide2. This is only necessary for ide2 (Clover), not ide0 (Mojave). I encrypted my disk when filevault2 appears I cannot enter password. Any ideas? I haven’t been able to get this working yet. I think there is an EFI driver needed for the keyboard. You can boot into the recovery mode to unlock the disk I believe (that’s a full copy of the OS so it supports the keyboard properly). i have problem – on booting I get error message. Do you have any idea how to solve it? From the message it sounds like you might have two ide devices on the same bus (e.g. 0 + 1). The second IDE drive needs to be assigned to number 2 rather than 1. (drive #1 would be the slave of #0, which isn’t supported). And how to setup it? I have added devices via web? Edit the config file for the VM using SSH (it’s in /etc/pve/qemu-server) and rename the config line for ide1 to ide2. Now it looks like this – so what I need to change – because there is already ide2…? You need to use ide0 and ide2, avoid ide1. Great! Now it looks fine – thanks for help! It sounds like you have forgotten to add the “cpu” argument to the args, which is required for proper timing, so the clock runs fast and the key repeat is accelerated. I have (from beginning) setup 1 socket, 4 cores, Penryn. Is there any other option? Is it connected with boot problem or its different problem? Thanks a lot! Now it works perfect! I installed HighSierra from iso and just having this enoch_rev2898_boot. Do you know how this can be resolved? PS did not use clover things etc. Enoch can’t boot APFS as far as I know, use Clover. 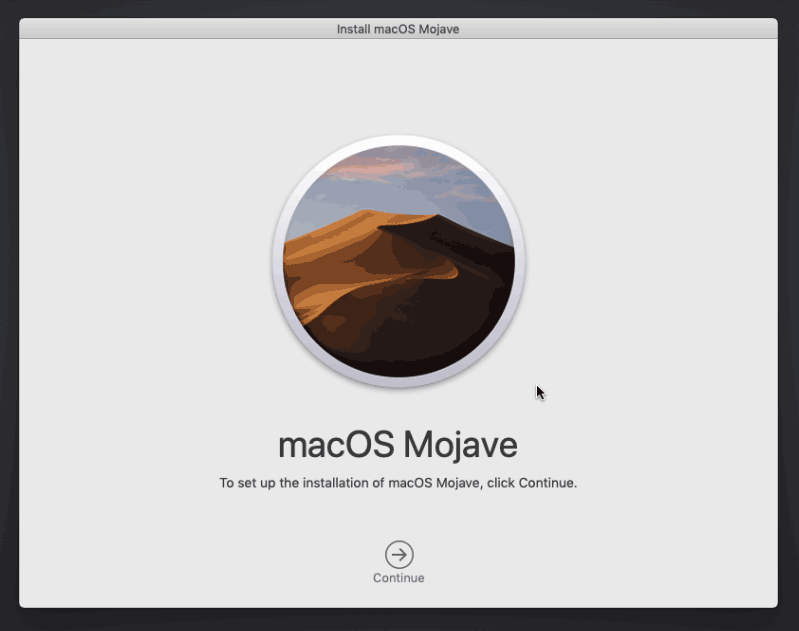 Diving straight in as a new Proxmox user I decided to follow this guide and install the now launched Mojave. Having checked my working twice now I can’t find any mistakes but find myself stuck on the apple logo right at the stage of selecting boot macOS install from clover. Seems to sit there indefinitely – longer than I have patience for! with no errors visible. Any suggestions welcomed – even if it’s just to look elsewhere for error logs! Sep 30 15:44:28 pve systemd: Started 103.scope. Sep 30 15:45:00 pve systemd: Started Proxmox VE replication runner. Sep 30 15:46:00 pve systemd: Started Proxmox VE replication runner. Your config looks good, try pressing space on the installer option in Clover and choosing Verbose Boot, this’ll reveal at what point it locks up. I’ll probably be rewriting this tutorial soon for the final release of Mojave, so if you get completely stuck, come back here later and see if I have figured everything out :). 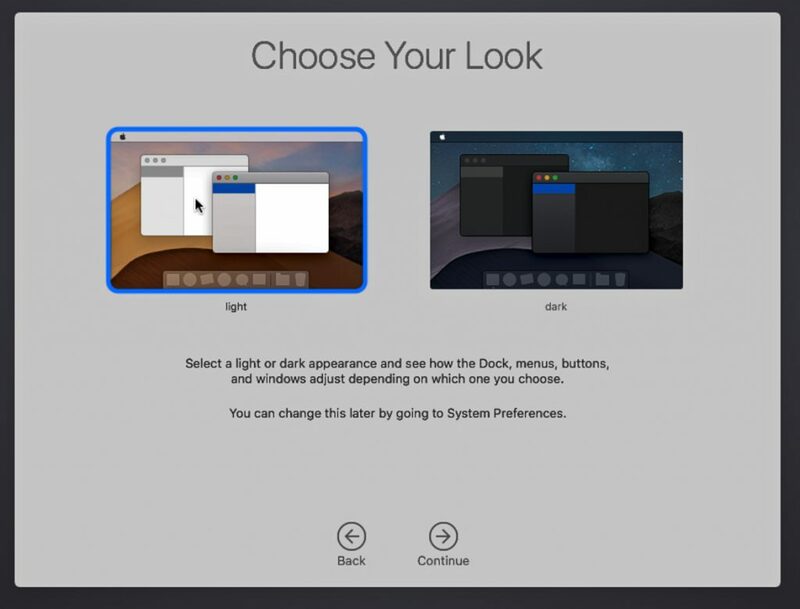 I’ve updated the tutorial now for the final release of Mojave, and I didn’t find any surprises (though I am now including a newer release of Clover, try that one). Make sure that you have installed the patched UEFI package into Proxmox, it causes a hang on Mojave boot if it’s missing. That’s it – had missed the instruction to patch UEFI, and even on verbose boot I didn’t get any error messages! Once applying the patched file I was up and running in no time at all. Many thanks! Just wanted to throw a feedback that it is also working with the live version. However I had to use a different strategy to get the .iso. Thanks mate for the nice howto. First, thanks take the time writing these up. I’d used your guide to install High Sierra before with great luck before (on a different Proxmox host machine). root device uuid is ‘ACB39C20-0C7B-3B0C-OB03-79EAOBBE3302. Some searching seems to suggest it might be a ram issue? I’m really not sure though, or how to fix it. If you had any suggestions, I’d appreciate it. Yeah, dying so early seems to mean that OsxAptioFix3Drv failed to create a workable memory layout. This is unusual on a VM however since we should all have the same emulated address space layout. Check that you have the required Proxmox version, your “machine” line is correct, and your CPU has the required features (SSE4.1 is most notable). Redownload my Clover image just in case. How much RAM are you giving the VM? Great set of instructions! Thank you for taking the time. 2 questions / problems that I’m having if you can help. 1. Do you need to set the OVMF resolution at boot-up everytime or is there a way to make this configuration permanent? – I’m able to set it to 1024×768 and press reset to avoid scrambled display but I need to do this every time starting the VM. Can this be set? – Also is this is the only way to increase resolution beyond 1024×768? 2. 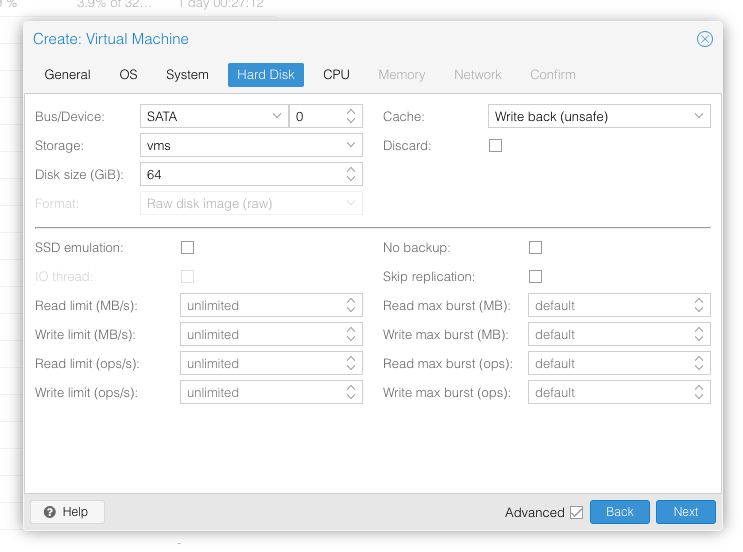 I’m experiecning a VM lock-up / hang many times after the VM has been running for a bit. No crash but a complete lock with no mouse/keyboard input possible. Any ideas? Make sure you have added the EFI disk to allow it to store the UEFI settings permanently. Yes, to increase screen resolution further, you need to use Clover Configurator to set your Clover GUI response higher, then set UEFI resolution to match. I’m having the same issue getting stuck after “End RandomSeed”. I have the most recent version of Clover that you had attached, with a fresh install of Proxmox 5.2. I have it configured for 64G RAM and dual 6 core CPUs (running as sole guest on a dual 6 core xeon machine). I’ve checked and my cpus support SSE4.1. Any ideas? – desperate to get this working! Try passing through a different core count (like 4), it doesn’t seem to like some combinations (probably something that could be fixed by changing the CPU ID that Clover reports). Make sure you’ve installed the patched firmware deb into Proxmox. Changing cores from 6 to 4 worked, thank you! Has anyone noticed that the os x guest doesn’t appear to fully utilize the underlaying hardware? In my case when I look at my guest CPU utilization while performing an intensive task (video encoding for example) the guest appears to be utilizing 100% CPU. During the same time when I look at the host utilization in proxmox it appears to be lower. Its hard to see for certain. This is a single guest on the host. You’re probably just seeing the difference in the way that CPU usage is reported. macOS calls one core being fully saturated “100%” usage, but with a 4 core guest, Proxmox would call that only 25% usage. I can happily use “98% of 32 CPUs” as reported by Proxmox when running a CPU benchmark in the guest. Worked perfectly with Proxmox 5.2 and Mojave. Kudos. Many thanks for this amazing how to ! I was able to have a machine up and running in no time ! Looks like it refuses to enable the caching if it detects you’re running under a virtual machine, very curious. It’s possible that you can avoid having the VM detected by macOS by setting “vmware-cpuid-freq=off” in the args (instead of “on”) and “kvm=off”. However in this case the timing in the guest will be off (you’ll probably notice window animations playing at the wrong speed and the realtime clock will drift etc), so it might only be useful for non-interactive usage. I tried with kvm=off and vmware-cpuid-freq with no success, same error ! Are you able to access the VM per Spice instead of VNC? For me, no booting from clover ISO :(. 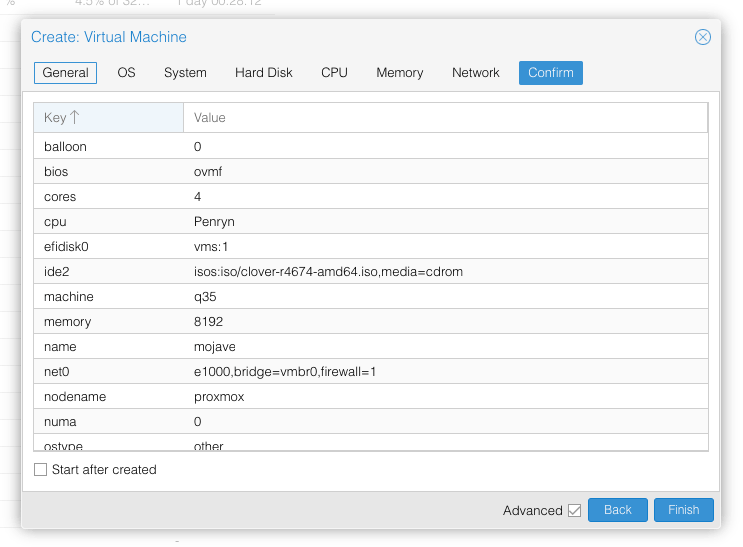 Proxmox 5.2, Installing the fixed OVMF. I used my Mojave.iso and Clover.iso to build a VM in virtual box on one iMac and Ubuntu hosts, so I think is not the ISO files. I don’t know where is my mistake. I also tried with this clover, but no boot either. The Clover menu doesn’t even appear? Make sure you have removed media=cdrom from the Clover device. But Shell EFI is the only one. You need to add media=cdrom back to the Mojave line. Is your CD/HDD is IDE or SATA ? and witch numbers ? On Proxmox, run dpkg -l pve-edk2-firmware. You need to see 1.20180612-1, and not 1.20181023-1, which is a newer version from Proxmox that I haven’t released a patch for yet. Make sure you’ve added an “EFI Disk” to your virtual machine, because it’s needed to remember your screen resolution settings. IDE and SATA both work, but use what the tutorial suggests, because that’s had more testing. Hard to find the mistake. It looks like you didn’t unzip the Clover ISO, it should be 256MB. Yes it’s beacause I use my clover, so i change to use your clover.iso. And after commit save, I used the last menu boot manager to add new value to boot on the disk with clover and after reset it’s a boot ! I dont kown why my clover is not booting but i think the EFI disk is not saving configs for me. I was able to set everything up but when I booted the installing from clover it will load the apple symbol and then I will get the crossed circle half way through loading in. Hit space at the Clover screen and enable the verbose mode so you can see what it’s stuck on. Double check that you installed the required firmware deb package. I think its gets stuck when looking for root device, and I think I installed the right .deb files. I used the one from the link you suggested the pve-edk2_1.20180612-1_all.deb. Other then that I’m out of ideas what it might be. I’d suggest rebuilding the Mojave ISO, I can’t imagine what else could trigger that error. Do not upgrade to 10.14.X (for me it’s 10.14.1) you will lose the access to the disk with the crossed circle half way through loading on boot after install. That same upgrade worked fine for me (I use passthrough hardware though, including my storage device). I found why, it’s the backup I made do this on the VM. Maybe it’s more don’t use backup mode “stop”. Yes I already try to change it but i have rebuild a fresh one with no backup this time. Anyway, did you will make a clover build guide? Thanks a lot for your help this tutorial is very cool ! thanks ! This command only works on a Fedora (>= 27) host machine. Then I converted the resulting qcow2 to raw format. The Clover.iso add a script to make Clover permanent when the install is done (to run after the boot). maybe we can use it for the build. I’m not getting the “Boot macOS Install from Install macOS Mojave” icon in Clover. Nothing shows up when I stop/start after the resolution change it just has the original menu items still. Post your VM config, you probably accidentally removed media=cdrom from the Mojave ISO. That looks correct, you may need to rebuild the Mojave ISO. Just tried another ISO and still same result. The ISO would have to be pretty malformed to not appear as a boot option, what do you get if you run “file Mojave.iso” from Proxmox’s ISO directory. How does clover find the Mojave iso? Very nice post, extremely detailed w/o room for an error. That’s curious! Thanks for posting that tidbit because it’ll probably help someone else too. I suspect this is related to usage of “pc-q35-2.11”. When switching this to plain q35 the vm starts and I can access UEFI via console, but I guess I will have issues later on with osx. That’s weird, it looks like Proxmox is choosing the piix3 chipset instead of ich9. 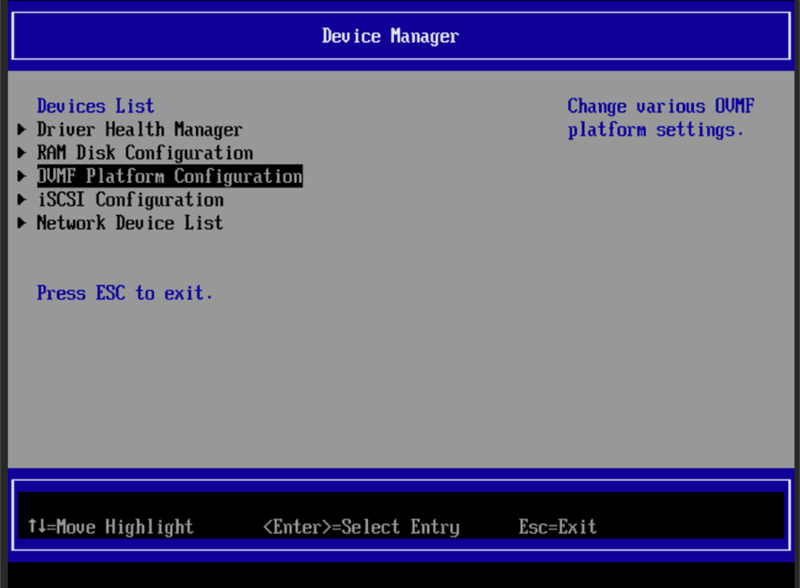 In the VM settings double check that you have the OS type set to “other” and the BIOS set to OMVF (UEFI). Thanks for getting back to me, @Nick. Yep, OS type is set to “tore” and I’ve selected OMVF (UEFI) as the Bios. I have a couple of other VMs running (mostly linux and windows) and also preconfigured the system for gpu passthrough. I’m wondering if any of those modifications messed up the system; but I don’t believe so. Do you have a subscription for Proxmox? Maybe the packages are different when using enterprise vs. non-subscription? I do have a Proxmox subscription, but it basically just releases some high priority patches sooner (and my setup has been working for ages, those patches are definitely in the community version). What’s your QEMU version(dpkg -l pve-qemu-kvm)? Mine’s 2.12.1-1. If your QEMU is old (predating Proxmox 5.2) then it might not know q35-2.11, and fallback to something else. Maybe post your VM’s configuration file here too so I can check that out. Something is triggering your QEMU to use a whole different architecture. I have the same QEMU version. When looking at the machine configs for QEMU (qemu-system-x86_64 -machine help) it looks like q35 is just an alias for a later version q35 (pc-q35-2.12). Currently I am just trying going forward with this – at least it books into Clover. Ahh, maybe it was choosing the pc-i440fx machine model (PIIX3 chipset) because you have a passthrough device set to use PCI rather than PCIe. It might have worked with “hostpci0: 00:14.0,pcie=1” instead. The newer pc-q35-2.12 is likely to work fine for you though if that’s what it ends up using (try “qm showcmd VMID” to verify that it mentions “ich9” and not “piix3”). I don’t think that’s the reason. The same happened without the passthrough device (I initially started without one and was planning to add them later on). I’ll let you know if I’m successful with q35-2.12 – right now I am stuck on memory issues (comparable to what was mentioned above already – the installer crashes with End RandomSeed and a bunch of +++). Ah that’s fine, I think that chipset only ends up appearing in the launch command once you start passing hostpci devices through. I was able to boot a Mojave VM using 2.12, so it should be compatible for you (I didn’t test the installer though). One of the other commenters here, Tony, also had that memory issue, which was triggered by passing a core count of 6, same as your config (I’ve also had trouble passing “exotic” core counts). Try 4 instead. Damn, I saw that, but reverted it earlier. Setting my #cpus to 4 fixed that. Looks like the installer is now booting. Fresh install of proxmox 5.2 today, updated with the no-subscription repo. Can confirm that pc-q35-2.11 causes problems. Setting to q35 works fine. After install, I passed my radeon 7850 using the recommended pci ovmf (needed to specify romfile). Seems to be working out of box, with it reporting metal as supported. However, it seems DRM videos aren’t playing in Safari. Monitor supports HDCP. Do I need to figure out Shiki/WhateverGreen kext for this? Interesting, I guess I’ll update the guide to use that instead now. EDIT: Yep, I just updated Proxmox to the latest version and I’m seeing this problem now too, updating to “q35” or “pc-q35-2.12” is required. I’ve never seen any DRM content on the web, is there a free URL that I can try that out with? Sorry, I’ve never really used a mac before. I believe I read that movie trailers in the itunes store are drm protected? Been researching this all day, and so far I’ve found a few things. -It’s been reported that the 10.14.1 breaks something and people have had success downgrading AppleGVA to the 10.14 version. -Lilu/WhateverGreen is likely required. I’ve simply put them in /efi/clover/kexts/other but I believe they may require additional setup to work with mojave. -I’ve used Clover Configurator to try a few different smbios settings, and MacPro6,1 seems the most promising. With the downgraded AppleGVA, I’m able to get an error (Netflix in Safari) instead of being immediately redirected to the unsupported page (MacPro5,1 and the default unconfigured smbios). -I’ve read that working imessages etc is a prerequisite to getting working drm, so I’m looking into that now. Otherwise, the vm seems to be working reasonably well. Metal is shown as supported. I can switch back and forth between macos and windows vms without any issues (had to switch to the 2nd dvi port for macos to reliably display on boot). No extra steps are required for Lilu/WhateverGreen as far as I know, I have both of those in kexts/other too. Ah, I tried signing up for a trial of Netflix and yeah, it’s not working for me currently in Safari (just redirects me to the System Requirements page). I tried it out and I am able to sign in to iMessages, but I don’t use that app so I’m not sure if that’s enough to confirm that my Apple ID works fully. EDIT: Oh, Netflix works for me in Chrome! Shame that only Windows supports 4K Netflix playback. Wow thanks for trying all that! I completely forgot about the bitmovin demo. Alas, it does not work for me either. which worked to mark en0 as builtin. With that and MacPro6,1 smbios, I get the cannot sign in to imessages on this mac at this time / contact support message. That’s a good sign as far as I understand it (assuming I don’t care about imessages..). I tested all the macpro smbioses 3,1 and up, and 6,1 is the only one that doesn’t redirect netflix to the requirements page. The imacpro smbios works as well. I haven’t tried any other configurations. I suspect this would fix safari netflix for you since the bitmovin demo is working. Unfortunately, my only goal for setting up a hackintosh is to have a testbed for fairplay drm. It’s pretty remarkable how well everything else is working. Your 280x is the same generation gcn as my 7850, so I suspect our results should/could be similar. I’m going to try your iMac 14,2 setting now. Are you on 10.14.1 as well? And without swapping in the older 10.14 AppleGVA? “inject ati” unticked as well? Thanks so much your testing. Hmm, looks like iMac 14,2 isn’t redirecting to the netflix supported platforms page either. Yeah, I’m on 10.14.1, AppleGVA is completely untouched, and InjectATI isn’t ticked. There are a ton of ways of detecting VMs, so Fairplay may or may not be using this method. The Bitmovin demo does work for me, and chooses Fairplay in Safari. In Chrome it chooses Widevine which also works. Doing some more testing today. 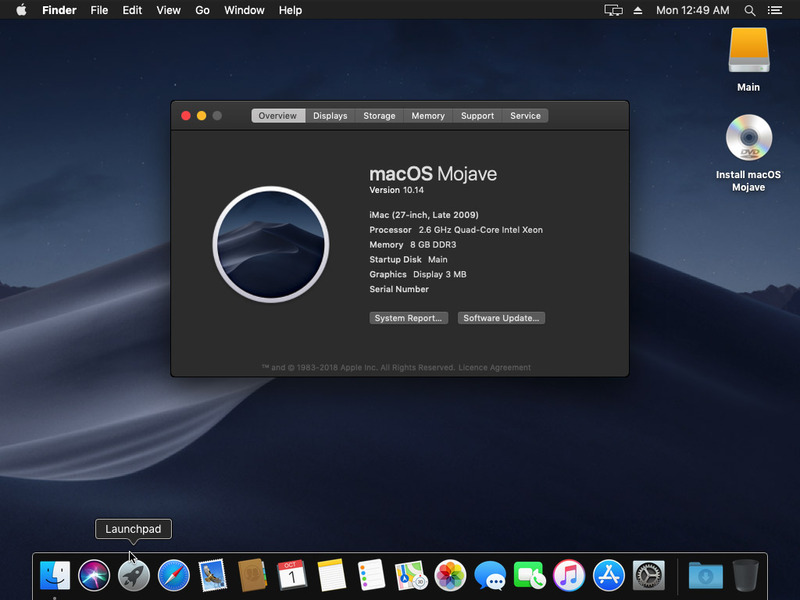 Going to give Mojave 10.14 a shot. I saw from this thread (https://www.insanelymac.com/forum/topic/336278-mojave-10141-breaks-radeon-hardware-decoding-no-igpu/) to use videoproc to check hw accel. Surprise, surprise, mine shows as unavailable. Tried removing disk from hotplug in vm options, but it doesn’t seem to have any effect. Not seeing any options in ovmf either. Would like to avoid a kext route, but it’s there for anyone interested. Interesting tests. Oh I nearly forgot to mention before, in Clover’s config.plist make sure it isn’t set to InjectKexts: false, or it’ll be ignoring your WhateverGreen kext completely. Oof you’re a mind reader. It’s now showing the 7850 as an r9 270. VideoProc still shows no hw acceleration and safari fairplay is still failing. This is on an otherwise fresh install of 11.14.0 with smbios set to imacpro1,1 or macpro6,1. Might have to break out the 7970 later tonight since that gpu is working for you. Ha this issue has me tearing my hair out. Gave High Sierra a try with the same results. Meanwhile, it looks like setting the hard drive to IDE is the best solution (assuming there’s no performance penalty, although I haven’t tested) to having it be internal. It’s still shown as a SATA device in macos. I don’t believe vendor and +ssse3 are necessary (they should be included by the Penryn setting). Jeez, it’s working. I had a theory a few days ago that videos weren’t playing because I had no audio device. Figured it was a pretty ridiculous idea so I didn’t explore it. Now that I have inject kexts enabled, I added applealc and tried a TV via HDMI again. Lo and behold, itunes/netflix/bitmovin fairplay demo all work. Don’t even need WhateverGreen. Time to figure out how to get applealc to work with the default q35 intel hda. Just needs to be a dummy device really. Thanks again for all your help. Going for a netflix trial was really aboveboard and is truly appreciated. I can not find a solution nor identify the problem! 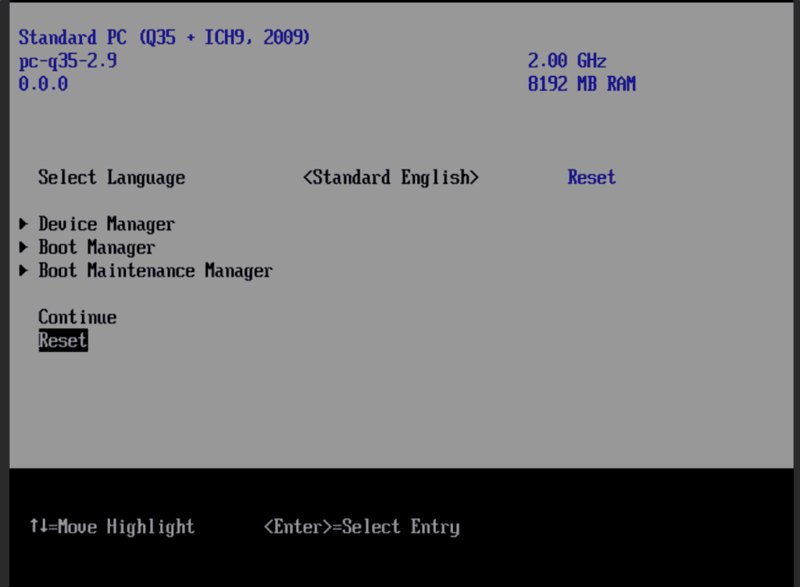 Replace “machine: pc-q35-2.11” in the VM config with “machine: q35”. It appears that the newest Proxmox version requires this change now. Just as a note, this works like a charm on an AMD Ryzen CPU. QEMU does the translation between Intel and AMD instructions, so you don’t need a custom kernel. GPU Passthrough works perfectly with AMD RX card. Did you follow what he did to the letter, or make your own modifications along the way? I have a Ryzen build and will be following in your footsteps. Any one passthrough iphone to this vm with success ? I need to passthrough my iphone to vm machine and connect it to itunes for make backups. 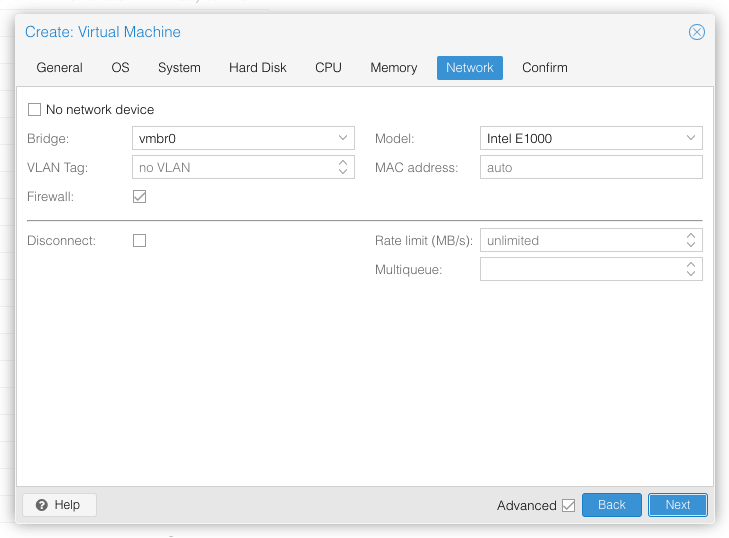 Since I upgraded to Proxmox 5.3, I can no longer use the VM. The problem is the keyboard doesn’t work, which doesn’t allow me to interact or boot Clover. I installed the latest patched pve-edk2 packge, and re-added the USB Keyboard to pve-q35.cfg. I upgraded to 5.3 and cannot reproduce this problem. 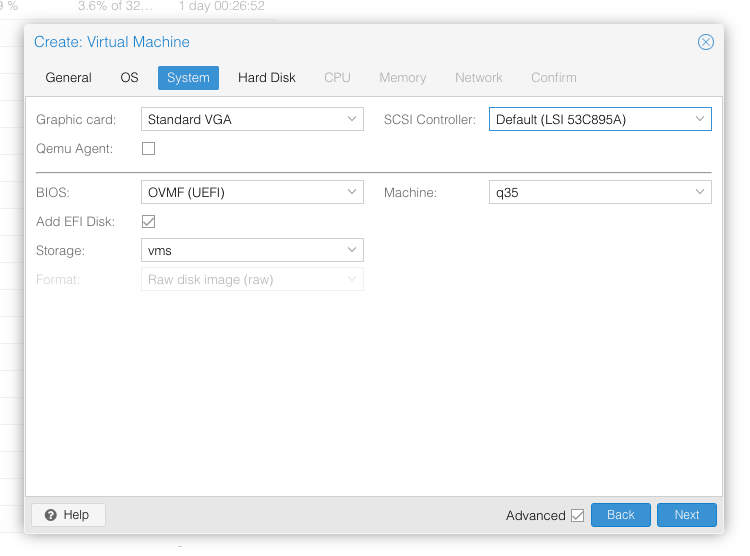 Are you using “machine: q35” in your VM config? That’s the one that works for me since late in the 5.2 release cycle. You can also try rebooting the host just in case it’s somehow caching the old pve-q35.cfg file in memory. Thx a lot for this, worked flawlessly. One issue, here, do you have any idea why I can’t enable content caching ? I’m logged in iCloud and globally everything works. Yes, when trying to enable that using the command line, the error is revealed: macOS refuses to enable it because they have detected that they’re running in a virtual machine. Probably their binary would have to be patched to bridge out this detection. Led me here, will dig from there. Thank you for a great write-up! I’m new to Proxmox, relative novice w/ VM’s (last played w/ Xen @5 yrs ago), but I have built Hackintosh’s for the last several releases. Learned a lot following your guide. Everything worked as described for Proxmox 5.3-6 on i4770k/z87-pro. 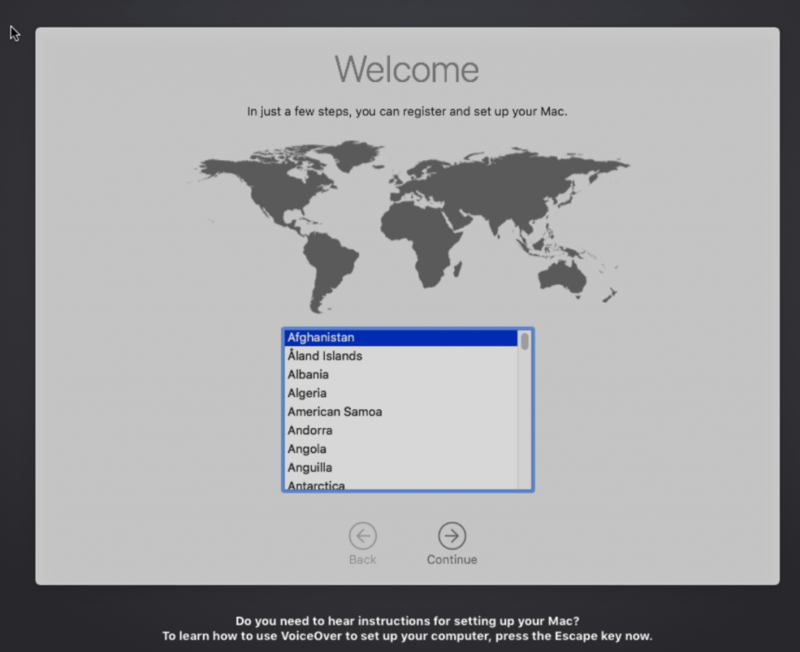 Even did the Mojave OS update to 10.14.2, though that required manually restarting the update installer from Clover. Easy to fix. It boots, so only question is whether these syslog messages are expected or not? I’m guessing the “ignored” warning is actually correct behavior? I have lots of rereading/learning, testing, adding disks and passthrough devices and whatnot to go, but thank you for the tremendous head start! Yes, I think these ignored warnings are correct behaviour. The guest is just probing for features that the QEMU virtual CPU does not support. (I get the same). This is why the ignore_msrs setting is set to Y, because otherwise these would be fatal errors. Really awesome guide, very much appreciated works flawlessly! Like someone above i’m also unable to get my iphone to pass through to the vm, really not sure why. Passing through a thumb drive worked just fine, and attempting to pass through an entire usb controller (i have a pcie add-in card specifically for this) doesn’t work either. Pretty stumped..
Do we need to do any changes for Proxmox 5.3? Or does the patch need to be updated, to re-base against 5.3 for other bugfixes? The line numbers have changed for 5.3, but the actual content of the patch doesn’t need to change. Make sure you didn’t remove media=cdrom from the Mojave ISO line. crashed: opendirectoryd. Too many corpses being created. I am having some trouble getting to the Mojave install screen, I get to the Clover screen, push space to enable verbose, then enter on the install icon, and the boot goes as far as https://images.themadcracker.com/proxmox.mojave.boot-error.png and then the VM resets to the Proxmox screen and starts over, any ideas what I am doing wrong? Visiting the link you supplied fails with “ERR_TOO_MANY_REDIRECTS”. Hey guys, I’m running Proxmox 5.3 with latest updates and trying to install Mojave but hitting a kernel panic when trying to boot the installer. I just did this some weeks ago on another system and it went swimmingly, so I’m fairly confident I’m following instructions correctly. However I’m afraid it was PVE 5.1 or 5.2 I used then, so perhaps that’s the difference? I’ve done my best to try and capture what’s triggering the panic but it goes by too fast even when doing local screen recording to capture. Forcing CS_RUNTIME for entitlement: com.apple.rootless.installNotice - new kext com.apple.driver.KextExcludeList, v14.0.3 matches prelinked kext but can't determine if executables are the same (no UUIDs). 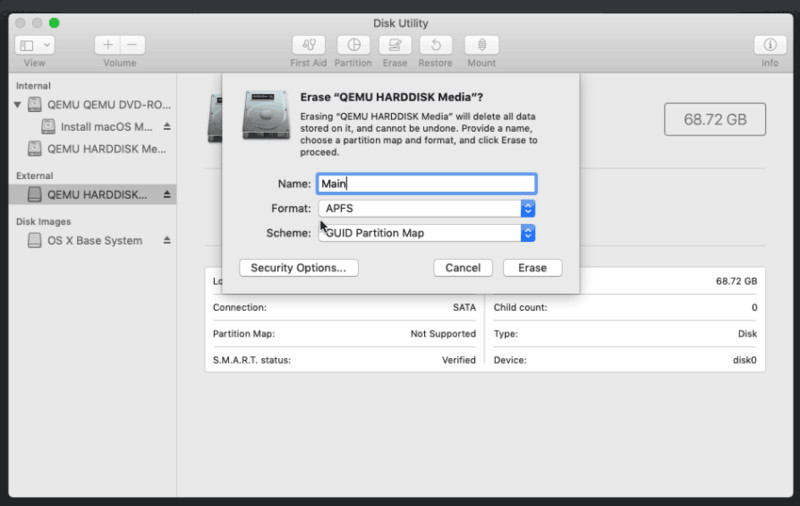 Did you follow the instructions to format the disk using Disk Utility? Any tips for how to control the VM resolution? It boots as an iMac with 1920×1440 resolution, which is a little tall on my 5k iMac’s screen. I’ve done some googling, and there are lots of tips for VMware or Vitural Box, not so much for PVE. That’s a weird resolution. You should be able to change the resolution in the guest’s UEFI settings, although you have to edit the resolution in Clover’s config.plist to match to have it boot correctly. Yea, it’s weird, I’ve changed the clover settings at boot and in the config.plist, but it’s not having any effect on the Mojave resolution. Clover comes up in that resolution but MacOS stubbornly. I should just need to do the mount /Volumes/EFI and edit /EFI/EFI/Clover/config.plist with the below correct? How do I change the UEFI settings? You ever figure this out? I have the same issue. Successfully changed the resolution in clover and UEFI settings but it has no affect once the VM actually boots into macOS. I have no idea what it is doing with the last virtual adapter – I can not see it from the mac, and now I can keep the UEFI (and Clover) setting of 1920×1080..
One further note: my investigation leads me to believe, that it is not forcing a specific resolution, rather a specific aspect ratio 4:3 and not the 16:9 specified.. Thus when setting 1920 in UEFI, it is then resulting in 1440 height..
Now everything is working for me (even Store and iMessage) – but performance is not great.. (and I have very fast storage 8 MLC SSD’s on SAS3), not sure if it is the virtual sata or virtual gpu that is killing it the most, but I believe Mojave is more relying on “Metal API” than previous versions – and thus the penalty from virtual GPU is the real problem.. The virtual GPU performance is suuuuuper terrible, I would not consider using the virtual GPU for everyday desktop use. I do have exactly the same situation. Have you found a solution for that? In the meantime I’ve just scaled it down, which works OK, but I’m still looking for how to adjust the UEFI boot setting. Hit F2 when the Proxmox logo appears during guest boot. You may need to edit your q35 config to remove the USB keyboard and start and stop the VM first. Hmmf. I have the OVMF settings at 1600×1200 (and other lower settings) but it continues to boot to 1920. I probably have something set wrong, but it really wants to open at that resolution. You may be able to pass 8 cores. For some reason it doesn’t like strange numbers of cores. Yeah , 2 sockets . 4 cores each work good . Another concern , can we simulate cpu as host ? disable hypervisor for cpu to act as physical cpu to enable nested virtualization . my goal to run genymotion “Android virtual machine ” on this mac osx guest . I’ve never had this working, macOS seems to dislike the reported CPU type if I try that. You may be able to get it to work by using Clover’s CPU ID faking tools. thanx again for terrific guide!!! even its a heavily outdated tutotial, I belive the concept stsys the same… I explain you my idea: I have 2 hosts, they have very very similar hardware (different revisions of same mobos, different count of cores on same cpus), ONE AT HOME (300mb fiber), ANOTHER AT WORK (50-100mb over wifi), ping suppose to be about 10ms, both used exactly like yours – as desktop machines w swapping VMs back and forth, w smaller ssd for few actual VMs and larger hdd to store unused or rarely used VMs, no external storage, all on zfs, but honestly zfs concept is a bit too much for me for now to diadgest so probably I will remove zfs shortly… anyway – I’m looking for a way to sync those two hosts. Clustering is not a simple concept, and my knowledge barely good to start experementing, but very good to blow up things many times – no good for daily used desktop enviroment LOL. and what is very important passedtrough videocards, cpu instructions and other hw? can you suggest other ways of more solid sync, may be a third party service, gdrive, use of a 2 node setup with external shared storage and sync it by night? zfs perks? Or weekly manual syncs will do too… also I do not have fixed ip’s, and I have to investigate if I can obtain it. Also I have a large dogy WD MyCloudeHOME (the keyword HOME, as it is not a true NAS server but some strange WD server, and can be accessed by linux/osx for backup but only locally in public samba share, otherwiseo only as a gdrive over their proprietary software or webinterface). Also a manual sync with phisically attaching a drive would do for me – but how to make it elegantly? just want to open a conversation w everybody for such a concept of syncing 2+ desktop used PVE hosts!!! 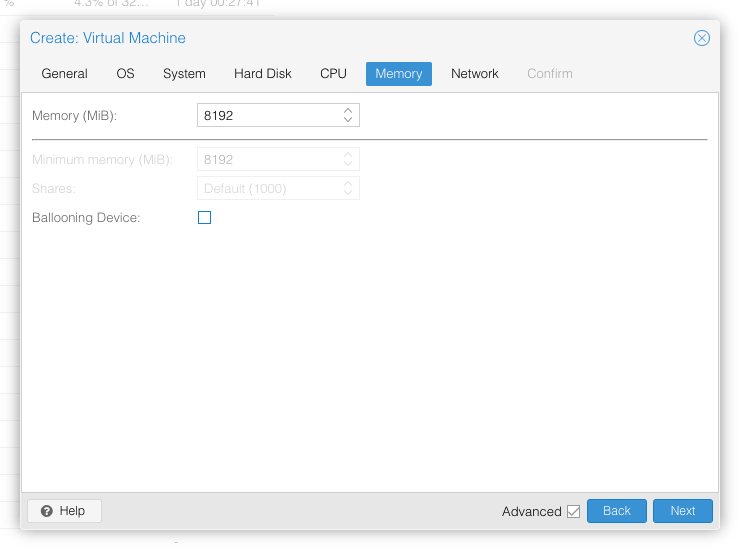 Live VM migration on Proxmox (true clustering support) is disabled for VMs that have passthrough hardware enabled. 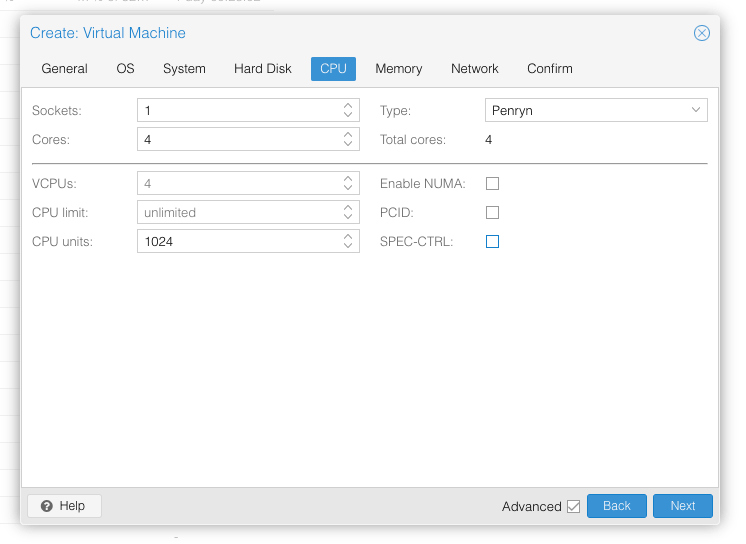 However you can probably use the Ceph clustered storage engine to share a VM disk image between two nodes (so that you can shut it down at one location and start it up at the other location with minimal waiting time). I haven’t tried Ceph myself. The absolute minimum for passthrough is the graphics card, otherwise the performance is godawful. Everything else can be emulated with fair success. Have you met this yet? Sorry I’ve never seen an error like that before. Maybe the macOS system logs have some more clues as to what went wrong. Hi Nick! Sorry at the first, for my english (not my native) and for my blind (perhaps) eyes – i don’t understand how to work graphic card in mac os? Is there full acceleration? Which hardware is support (whats the better Nvidia or AMD for the best build) and can i use 4k display connected in my graphic card with 4k2k resolution (60hz)? Another one – can i use the iCloud and imessage in MacOs? I’m asking because in this moment just interesting for using Proxmox for MacOs and want try to select hardware (exception Display – already have) for best using. Thanks for answer and advice. iCloud and the App Store definitely work. Getting iMessage to work requires a bunch of messing around with setting serial numbers in Clover, and many people never get this to work. There are a lot of tutorials available for this on the ‘net if you search. I tried using iMessage today and it doesn’t work for me (I can log in, but can’t send or receive messages). Hey man. After many head scratching hours I managed to make it though. One thing I wanted to point out: my system was not initially outputting video properly after selecting the OSX installer from clover. Turns out it wasn’t handing off the resolution properly, so it was totally scrambled and impossible to read. The fix was to go into clover settings, then Graphics, then load Vbios or force vbios. Don’t remember what it was called exactly, but it will have EDID display options above, then the last option will be VBIOS related. Enable it by using the arrow keys to navigate to it, then pressing space on it. Hi, great guide, helped me install on Proxmox 5.3! 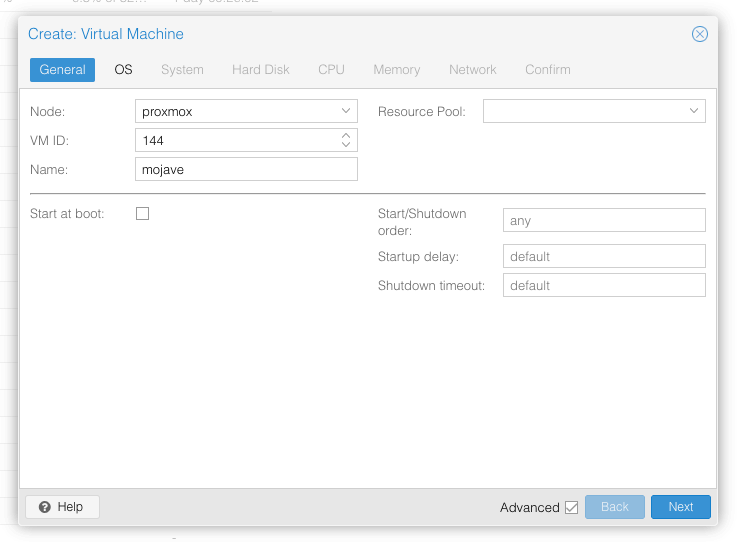 However, the instructions seem to be broken on Proxmox 5.4, as the VM cannot find the Clover ISO. Any idea as to why this would happen? Works perfectly for me on 5.4. Most likely you didn’t follow the instruction correctly about editing the media=cdrom part of the Clover ISO config line. Show the config line you have for that ISO. Yup, that’s exactly what it was. I had done it, but it didn’t take for a bit after. Now I’m just trying to figure out why my passthrough isn’t working… Great guide though! I’ve now updated the screenshots and instructions for 5.4’s re-shuffled UI (there are no material changes, the settings are just in different places). I’ve also added an example of what your VM config should end up looking like.